Dan Faggella runs scienceofskill.com where he provides skill development training and resources for martial artists. Dan himself is a No Gi Pan Am Champion and teaches seminars for others wanting to improve their skill in Jiu jitsu. He writes for national publications in the martial arts space as well. He used to run a martial arts gym, but is now focused on running an online business where he teaches skill development curricula to martial artists. He also helps other ecommerce companies through his other company, CLVBoost, build autoresponder sequences to boost their income. Dan is an expert in marketing automation strategies with a focus on boosting Customer Lifetime Value. Tim: We’ve talked until we’re blue in the face about content upgrades. You know those pieces of additional content that are specific to each blog post that you put out where you make people opt in to get them? One of the reasons they work so well is because they speak to your potential customer of where they are at that moment. They’re specific to that person’s interest and what their headspace is occupied with. 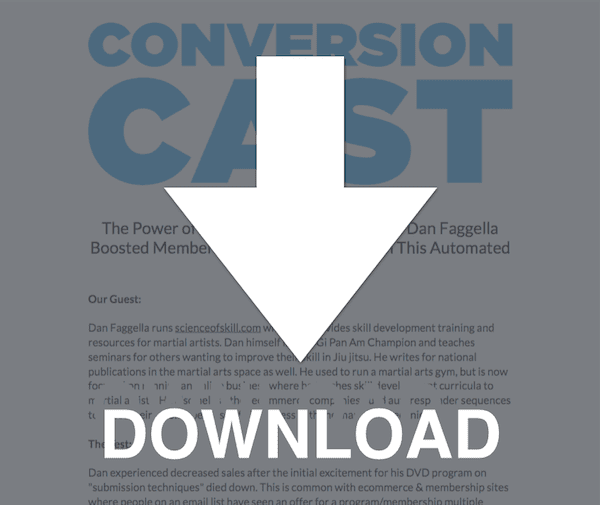 Today’s guest Dan Faggella from CLVBoost and Science of Skill used a similar concept but applied to his emails instead of just to his blogpost and was able to see a massive 40% increase in signups to his Brazilian jujitsu membership site. He’s repeated the same tactic with tons of other companies and seen similar results so I was super excited to share it with you and hopefully help you achieve the same. I’m Tim Page, the conversion educator here at LeadPages and this is ConversionCast. Hey, Dan, welcome to ConversionCast. Thanks for coming on the show. Dan: Tim I am glad to be on the show especially right after your birthday. Catch you in the best mood possible. Tim: –you give me after being at the arcade and watching Jurassic world like I’m 20 years old, it’s just great. Dan: Yeah. Come on, yeah. Tim: [Laughs] So we’ve got a fun one today. What I would love is if you could share kind of the results from this case study. Dan: Yeah. Sure so the results from this case study Tim I mean just to review, this isn’t one of our ecommerce businesses. I work in the kind of the ecommerce consulting world but also in the martial arts and fitness ecomm space. The results of this case study was selling somewhere like $57 a month programs from an automated email system. Tim: Nice. And we love that and I mean we’re talking about something that you’ve been able to figure out. You mined your data, you figured out what worked and then you put something in place so that it was automated and you didn’t have to stress about it. You didn’t have to go in there and you know, be doing a launch every ten seconds. So I always love that kind of thing. Tim: Can you share with us a little bit about I think probably the consulting thing is interesting and can you also tell us about your martial arts business? Dan: Yeah sure. So I mean the martial arts business was first so I’ll say that. I used to run a physical martial arts gym that I sold two years ago but the online martial arts business was basically just my idea of a location independent income when I moved from Rhode Island to MIT. And you know, essentially we sell skill development curricula to martial arts. So people don’t want to learn how to win competitions. They want to get to the next belt level and they want to learn from someone with a lot of experience. You know, I did a lot of martial arts and hung all the shiny stuff on the wall and taught for years and taught seminars kind of internationally and all that. Dan: -they want to learn from a curriculum and essentially our specialty is teaching people to beat bigger opponents. So I’m like 128-pound dude, Tim. I’m kind of a small fellow. So my thing is always having to deal with people bigger than me so we built a specific curricula, series of drills, exclusive interviews of world champions that gets rolled out as like a 16-month program that people can take around this martial arts deal. Instead of having just one membership sales page where people can sign up to join the program, we have multiple membership programs and pages so that people can you know, people with an interest in leg locks or chokes or escapes we have a front door offer for everybody to come in and they try out the program instead of just one. Tim: Nice. I love that and you also do some ecomm consulting. Dan: Yes. So well CLVBoost.com is the website that I started basically after this thing. So we sell a lot of memberships in the martial arts and fitness base. It’s like a $75,000 a month business right now and then I also. We have a lot of other people that sell in ecommerce world that essentially want autoresponders that make a lot more money. So we do a lot of this sort of testing and tweaking and building out autoresponders in the ecommerce space a lot of the time applying the same principles that we did in the martial arts world. People will have a membership site and fitness so they’ll have a physical product and they’ll need multiple different angles to sort of sell thing and so we build out those automated strings and chains. But it really all started, all the experience was kind of scrapping in and getting our way past the 70 grand a month mark in our own damn business here at the martial arts stuff. Tim: Perfect. I love it. alright, so speaking of the martial arts stuff, you are able to find out that there was a – there was a particular phenomenon if you will that was happening in your business where sales were starting to fall off a little bit. Can you share with us kind of what happened to cause that? Dan: Yes, yes I will and Tim this is really, really common in ecommerce in general but particularly with respect to membership sites. This is really far from isolated. We’ve replicated this in I don’t know seven niches or something. But essentially for us Tim we had one initially right. Everybody starts somewhere. We had one site where it was like hey here’s the membership program and here’s the bonuses that you get. Eventually Tim, you know you got yet 6000 people at the time. Right now it’s 20,000, 30,000 people or whatever is on the list now. But back in the day it was like 6000 people and they’re really all sort of seen that offer. You Know? Dan: And those bonuses that package of DVD programs, and additional interviews was exciting and it was enough to get a lot of people engaged but honestly, Tim it died as an offer. You know I mean our list, our subscribers learn from us, they’ve sort of seen it. May be some of them were not really all that excited about the initial DVD which was generally kind of about submission techniques and things like that. And it just didn’t really tickle their fancy. So what we did is we created a separate page in the martial arts space based on what our folks and our followers really cared about. So we pulled these people. We called these people. We figured out what they really were struggling with and what they wanted to learn and a lot of them wanted to learn the defensive side. They wanted to learn how to escape from bad positions and they had some particular positions that were really crappy for them. so what we did is we created. I went out, I filmed brand new programs from scratch just from what they asked for and we put those together and included those as the bonuses that came along with the membership program and now we had another page, another offer, another variation for people to come in and try out the course. Tim: Yeah that’s really amazing. you know I think it’s interesting because this kind of understanding this thing that you were able to discover really speaks to a lot of the way that people have to look at marketing. I know that a lot of people were coming in and saying hey you know what I need a great lead magnet just to get people into my list. So what should my lead magnet be and it’s like a singular thing as if you can just create one lead magnet and that’s all you ever need right? Dan: Yeah. That’s what HubSpot does right? Dan: They’re like 400 freaking lead magnets. Tim: –can really allow you to increase your revenue. I mean in your case you basically doubled it by doing this. Dan: Yeah but at least from that one particular autoresponder but we’ve replicated it so many times. again, it was a started Tim as an isolated incident In our martial arts business we’re like damn. You know, and Tim you think about it right? Sports Illustrated like they sell what? They sell a magazine right? Dan: –comes with the magazine. Sometimes they buy a magazine or a calendar of naked women or almost naked women in this sports illustrated thing. Sometimes they buy a plaque with their team on it and it comes with a subscription. So they have a lot of different interesting offers to get people to give the magazine a shot and why can’t little businesses like us that aren’t doing nine figures replicate the exact same systems? No reason why not. Now and again, this is what we plugged into other ecommerce businesses all over the place in fitness and all over the world. But essentially, in the martial arts business, that was the first real big jump was learning from the big guys and saying I can do that too. Just like you said you know, one thing does not appeal to your whole audience works for leads magnets, works for products, same deal. You got to tailor it to what they want. Tim: And how did you work all of these different offers into your autoresponder. I mean that might be a whole you know, webinar in itself but just curious. Dan: Yeah, good. Okay great, yeah sure, sure. So Tim basically what we did is we for autoresponders the way that we build autoresponders, I could get real complicated and dorky with you but I’ll be simple is education, social proof and calls to action that are explicit for products. So we essentially had the first 9 or 8 or 9 emails that are related to education around submission holds and techniques for finishing the fight. A lot of the time that’s a bigger stuff that people care about so that’s what it’s about and those all tied together with the calls to action around that submission DVD the first one that we offer. Then the next whole bunch of emails, the next six or seven of them relate to escapes. So we have educational content Tim around you know, here’s an escape video, here’s kind of some cool escape articles but at the same time, you know, intermittently every third email or may be at the bottom of those blogposts we’re promoting the DVD program for the escape. So we’re rotating our educational and call to action content in different chunks, 9 emails, six emails and I think another five emails that are related to the offer that they’re going to get. So they’re drinking in that content, they’re learning for free from us. They’re getting to see that they like our stuff and then they’re also getting the related offer in the same time. So we spread out the benefits, we spread out the value prop and the offers by the topic. Tim: Nice and so are you making an offer every email? Dan: –if I’m not and may be email 8, I don’t sell you anything, absolutely nothing. You don’t even smell a sales coming from my life but I do share a bunch of those where we break down five of our favorite videos techniques from world champions about how to escape from a side control, which is a very difficult position to get out of. So we’ll share that blogpost with you. Now at the very bottom of that blog post is a banner for this DVD offer with the membership program. In the middle of the blog post is a link that takes people to a video version of that same sales page that has another educational video but it’s very light. Dan: If people just want to watch education, they could. If they wanted to buy, they would. SO they’re consuming content they’re getting a lot for free, they never talk about selling in the email but if they’re hot to trot that day Tim, we’ll still get them. Tim: That’s awesome. This is a great, great idea for just about any business focus on different opportunities, different offers, different ways to get people into your business and go from there. Dan, thanks so much for sharing this with us. Dan: of course, Tim, thanks for having me brother. Tim: alright, that’s going to do it for this episode of ConversionCast. By the way, about that new theme music, I like it a lot. I think we’re going to stick with that. Anyways, so listen if you want to join me for a free live webinar, you can join me this Thursday at 3 p.m. eastern time for an awesome webinar called 4 Steps To Quickly Grow Your Email List Without Spending All of Your Time on Marketing. I’ll be sharing with you four simple steps to take that will do an immediate boost in email opt in rate and give you more time to focus on other parts of your business. If you want to join me for that webinar, you can do one of two things. If you’re here in the good old USA, you can take out your phone and text LeadPagesLive to 33444, again that’s LeadPagesLive to 33444 or if you’re outside the US, easy just go to LeadPageswebinar.com, again LeadPagesWebinar.com. You will be able to register for this Thursday’s live LeadPagesWebinar. I can’t wait to see you there and we’ll see you next week on ConversionCast.